This is the second post in a series of heroic tens encounter guides. The first one covered Heroic Halfus. It’s called a Business Time raid guide because that’s my guild. I don’t take credit for the strategy contained herein; I have written it out and compiled it based on guild member input and our forums. In fact, entire sections here were written by guildies . The tank healing section was written by one of our resto druids, Ullariend. The tank taunting section was written by Autoriot, our rogue, and reviews and information were contributed by other healers as well. Theirs is the toughest job on this fight, so it is only natural that they had more to say! Chimaeron is generally accepted as the “next” heroic mode to tackle following Halfus. Your mileage may vary; we actually defeated both Heroic Maloriak and Heroic Atramedes before getting a handle on Chimaeron. This fight is very similar to the normal version of the encounter and puts a lot of pressure on the healers and tanks. It is a definite gear check. If your healers do not have the mana regen and the throughput to last the fight and keep your raid and tanks alive through Feuds, you won’t succeed. If your DPS is not able to put out enough damage (especially in phase two) it will likewise be impossible. What’s unique to this fight is that a “Break” or tertiary tank is not optional. This can be any plate-wearing DPS (DK, Warrior, Retribution Paladin) or possibly a cat druid – any class that is able to taunt. This player serves the function of taking the Break debuff so that your real tanks don’t have to, because there’s another twist. During Feud on normal mode, Chim is too busy fighting with himself to attack your tanks directly. In the heroic version, Nefarian interrupts Chim and admonishes him to get back to the business of killing your raid. This means that you’ll need a tank for each Feud that does not have the Break debuff. The other change from normal is that past 21%, Nefarian emits a shadow aura that will damage your raid for 2K damage each second. As in normal, the raid is unhealable and so this acts as a soft enrage for the battle. If you trigger the final phase with your raid too low in health, you won’t have enough time to DPS him down before you die from unavoidable damage. The key to this encounter is managing your healer cooldowns, tank taunting, and carefully coordinating when you will push the final phase, at which point it’s all on your DPS. These are Chimaeron’s key abilities. Caustic Slime – Deals 270480 Nature damage and briefly reduces chance to hit for all enemies in an area. Damage is split between all enemies within 6 yards of the impact crater. 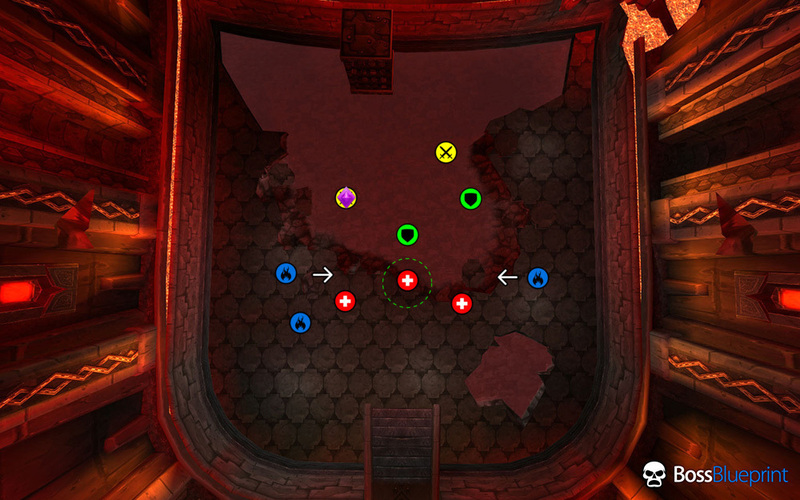 Massacre – Inflicts maximum damage to all players. Feud – Unable to perform melee attacks while his heads are fighting each other – until Nefarian interferes. Break – Chimaeron attacks viciously, breaking through his target’s defenses. Increases Physical damage taken by 25% and reduces healing done by 15% for 1 min. Stacks. Double Attack – Chimaeron will strike twice on his next attack. Mortality – Chimaeron goes into a rage, rendering him immune to Taunt effects but increasing the damage he takes by 10%. Reduces healing effects for all enemies by 99%. This fight is unique in that it requires a DPS player to act as a tank. Make sure that the person handling this task is comfortable with their taunt button and understands the mechanics of the fight so that they know when they need to taunt and why. Tank gear is not necessary and in fact will likely make it impossible for you to beat the enrage at the end. Your DPS can wear their normal gear and spec, but they may need to swap stances or forms in order to taunt. Our warrior stance dances from Defensive stance to perform his taunts. Because of their role tanking, your Break tank is likely to be one of the first to die when Chimaeron switches phases. This is actually of great benefit to you if you have a battle rez available. 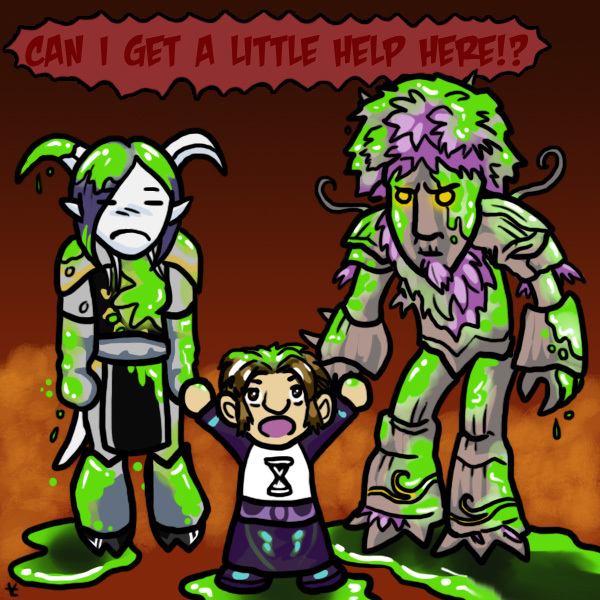 Once your Break tank goes down, have a (druid, preferably) battle rez him or her. They will join the action at full health, and their additional DPS will prove invaluable. An alternate strategy is to actually have three geared and specced tanks – giving one additional target for Chimaeron to chew through in P2. This isn’t the strategy we used but could be a viable option, although it will put additional strain on your tank healer who will have to top off not two but three tanks just prior to the transition. The battle rez in this case would be saved for the first DPS to die in P2. Healers that have strong AoE healing are very helpful for the Feud phases, and DPS that are able to reset aggro or delay pulling help with the final phase. In our case, we have two mages that save Mirror Image, and a rogue that can evasion tank for a time after the tanks have died. Any delaying tactic could make the difference between a kill and a wipe here! Note that this does not include kiting; it’s not possible to kite Chimaeron and so you may as well stay put with him. Everyone needs to maintain a minimum distance of 6 yards because of Caustic Slime. We position one healer in a central location (indicated by the green circle). This is where the raid will stack for Feuds, and that healer never moves. Put one of your least mobile healers here. Other healers arrange themselves nearby and the rest of the ranged DPS are arranged around the room (I always go to the far left because it’s easy for me to Blink into the group). The dot marked with a purple diamond on the left is the “Break” tank and the other tanks are in green. We only have two melee DPS at a time but if you have more you may need to adjust positioning to ensure everyone is six yards apart. His hit box is gigantic, so this shouldn’t be a big issue. Your Break tank should begin the fight by talking to Finkle Einhorn. Here is what the tanking should look like from that point. (You have a Break Tank, Tank A, and Tank B). Fight starts, Break Tank (DPS) is tanking everything but Double Attacks. Tank A taunts to take every Double Attack (watch the timers). Break Tank taunts back immediately following the Double Attack (it looks like a big swoosh in the air). Be careful not to taunt too soon! Feud starts, Tank A tanks everything and uses a CD for Double Attack. Tank A does NOT collapse with the rest of the raid. All healers must keep the raid close to full as usual, plus heavily focus on this tank. Tank B now takes Double Attacks. Tank B will now tank everything in Feud, using a CD for the Double Attack and staying away from the collapse point. Repeat, always rotating the Double Attack/Feud tank each time so that their stack of “Break” falls off. The RNG of this fight is how often feud happens. They can happen every 2-3 massacres (not counting the one right after Feud), so if you get them back-to-back too often, you’ll run out of tank and/or healer CDs. This is what the tanks will be doing, while the healers are spot healing members with Caustic Slime and then keeping the raid alive for Feuds. This healing is very intense and all DPS raid members should consider glyphing or talenting anything that will increase their healing received or grant them a self-heal. Draenei are able to use Gift of the Naaru, and our entire raid bandaged during the Feud phases. Feuds should happen more or less often enough to allow you to bandage each time. Every little bit counts! Once Chimaeron has approximately 25% of his health left, the timing gets tricky. Ideally, you want to push him into the next phase at the very end of a Feud so that your healers are able to top everyone up (but prior to a Massacre). If you wait too long, the raid will be too low to execute Phase 2 correctly. He transitions at 21%. We DPS right up until about 24%, wait for the next Feud, and then time it so that Phase 2 begins before he can Massacre. At this point, all healing is useless. Your healers should go into “DPS mode.” Your tanks should try to live as long as they possibly can. Use heroism and any other DPS cooldowns, and as mentioned above, have a plan for DPS to juggle the aggro long enough to kill him. If you are a mage, you should use Mirror Images at the very beginning of the encounter and then rather than using it on CD, save it for this phase. If your DPS can BURN HIM DOWN, you’ve won! Healing! Slime! Orange Fog! Our healers tell me this is their absolute favourite fight! Honest. Timing is everything for this fight, and watching your aggro. This isn’t something a tank usually has to worry about, but when it’s not your turn to be the active tank you must ensure that you do not pass the current tank’s aggro. Even if that means you have to stop white-hits, that’s what you have to do. If you accidentally pull Chim before your turn, you are likely to receive a stack of Break or a Double Attack making it impossible for you to tank when it IS your turn or killing you outright. We have someone announcing who is the current Double Attack tank at each transition so that healers always know precisely who will be taking the heavy hits. Use a cool-down as soon as Feud begins. The healers (at least 2/3) will be moving into place and preparing to heal the raid. You will be taking heavy damage. This was one of the major blocks we had to deal with as we were learning this fight, and we would often lose tanks at this crucial phase. If you are using your CDs appropriately to help healers and coordinating with your fellow tanks, you’ve got your part of the fight squared away. If you have any cooldowns available to you at the beginning of Phase 2, use everything you have to live as long as you can (but not at the expense of skipping out on these CDs during earlier Feuds). I’m going to be honest with you here: Prepare to be bored as your raid learns this fight. There will be many learning wipes, and it will feel out of your control – because it is. Your primary goal is to 1) live, and do everything you can to keep yourself alive and 2) do not push the transition into P2 early or late. You won’t get to practice that until your raid actually gets here, though. Once P2 begins, then it’s all up to you and you must kill him and kill him as quickly as you can. You will learn the rhythm of the fight and when to use your cooldowns so that they’re available to you in the final phase when you most need them. As our gear has improved, we spend some time standing around at the end; the first part of the fight isn’t exactly a DPS race (although of course you want to get him down to 25% ASAP). The fewer Feuds your raid has to deal with, the better your chances. Above all, remain patient and remember that your tanks and healers are juggling some pretty crazy feats. If you are a hybrid DPS, your services may be useful in off-healing during Feuds (Healing Rain, Tranquility if you are a druid, etc.) Coordinate these with the healers. Soon, it will be Phase 2. An incredible amount of burst DPS is needed to push Chim from 24% to 21% at the end of the last Feud. If you push him too soon, the raid might not be healed up. If you don’t push him quickly enough, a Massacre will happen and it’s game over. Once you’ve successfully transitioned, check Omen and your raid frames so you can see who is still alive, and who has threat, and whether a really big hydra is soon headed your way. Plan to use any threat reduction you have to live as long as you can. This is a somewhat gimmicky healer fight. Some healers enjoy that (most of the healers I’ve talked to hate this fight). There’s something about seeing almost the entire raid at 1% health that gives healers the shakes. You’ll want to give specific healing assignments as well as have a plan in place for coordinating healing cooldowns on the raid during Feuds. The RNG of this fight makes it impossible to determine exactly when Feuds will occur, but you can plan a sequence for when they do occur. This will vary depending on what healers you have available to you. Our raid plans for one druid to use Tranquility on the first Feud, and the second druid to use Tranquility on the second. Discipline Priests could of course use Power Word: Barrier (and Discipline priests in general could buy you some extra time in the final phase, because “reduced healing” does not apply to shields, and such a priest could shield the whole raid.) The healing for the final Feud is something that will vary depending on your group’s overall DPS. I’ve been told that when DPS is high enough, it deemphasizes the need to have the entire group at maximum health (because the burn will be completed before the soft enrage). If your group’s DPS is a bit lower, you will definitely want to make sure that healing CDs are available to top the raid off as much as possible before the second phase. The Caustic Slime can sometimes hit two people in the same group. If you are assigned to heal Group 1 and no one in your group is affected, you should help out the other healer and try to discuss beforehand how you will do this. (i.e. make sure your raid frames show people in the same order and agree that outside of your own group you will heal the person lowest on the list, or similar. It doesn’t matter how you arrange it, just so that all of the targets are covered!) I would add that making sure your frames are set up to display relevant debuffs (Caustic Slime, < 10K health) is pretty much mandatory here. You will need to get a feel for which of your heals can bring someone above 10K without wasting too much mana, because when learning this fight mana can definitely be a concern. Our paladin recommends using Avenging Wrath for the first Feud, Divine Favor for the second and then continue to rotate the two when they are off CD (but it’s unlikely you’ll have a CD for each). He recommends saving Guardian of Ancient Kings for the final “top-off” Feud. Beacon should be placed on the Double Attack tank. Paladin healers should also activate Righteous Fury for this encounter; this will generate aggro throughout the fight so that you will be the next target after the tanks die. What you’ll want to do is at the start of P2 run to a corner, when he gets aggro on you let him run towards you and BoP yourself. He will run back to the stacked group, cancel your bubble and he will run back to you. This helps buy the DPS some valuable time. Our raid healing druid recommends Glyph of Regrowth for additional healing. As mentioned above, strong healing CDs might be needed at the last Feud, and our druid used Tree Form along with Wild Growth and Tranquility at this point. The following is also druid-specific, but focused on tank healing. Your responsibility will be to keep the Break Tank above 10k, to top up the tank following Double Attacks and Massacres, and heal that tank during Feuds. Tanks: The tank taking the Double Attacks must be completely topped-off after a Massacre before the next Double Attack. If the tank is missing any health, and does not avoid or block the first swing, it can take them below 10k causing the second swing to kill the tank. During Feud that tank should be healed as quickly as possible after the Massacre and kept topped off. The tanks should be using cooldowns during this phase, but they can still take a huge amount of damage very quickly, and the closer they are to full health the more likely they are to survive. These two jobs sound simple enough, but it can be difficult to get healing out fast enough to get the Tank topped up in time, and to have enough mana to maintain the throughput for the full duration of the fight. 1. Get a head start on topping off the Tank by pre-casting your largest heal on the Double Attack tank so that it lands immediately after the Massacre hits. 2. Save mana by knowing when you don’t need to top up the Tank. When a Double Attack will be followed by a Massacre you don’t need to top the Tank off, just get them to 10k. If there are less than 10 seconds till the next Massacre when the double attack happens you will be okay. I strongly recommend Glyph of Healing Touch for tank healing. Since you will be using Healing Touch so much, this Glyph will reduce the CD of Nature’s Swiftness so that it is available every Feud. A +50% instant Healing Touch is very helpful for topping the tank up following the Massacre that begins the Feud. Pro-Tip: Don’t have the “Interact with Target” function bound to the same key as your Push-to-Talk key. When you are standing within melee range and try to say something in vent, fun things happen. And by ‘fun things’ I mean everyone dies. Heroic Chimaeron is a gear and coordination check for your entire raid. Most wipes will happen as your tanks grow accustomed to the taunting and timers involved, and as your healers learn to balance intense healing with mana conservation. If you can execute the first phase of the fight and learn to anticipate and manage Feuds, you’ll soon be tackling P2 which is a really easy burn comparatively. Good luck, and if you have any questions feel free to ask them in the comments!